We can also add other vegetables like carrot, beans, potato, cauliflower apart from adding peas, if you don't have fresh or frozen peas then you can also use dried peas just remember to soak it over night. 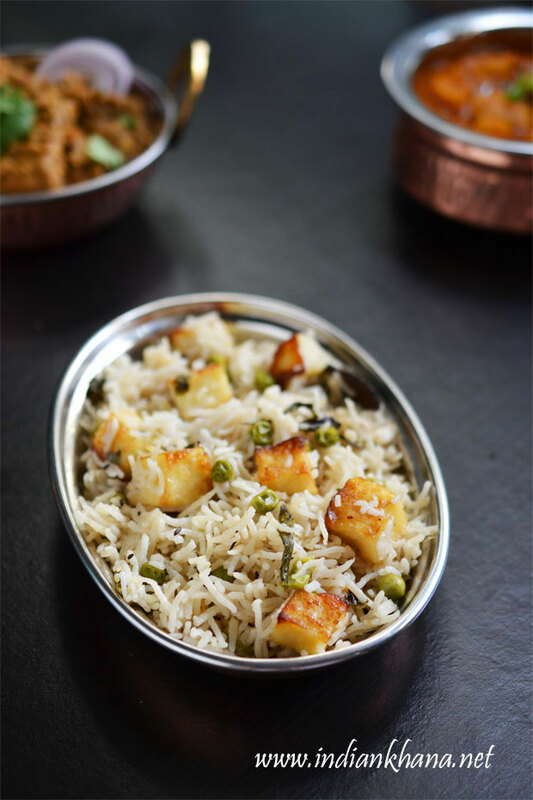 To make this pulao more rich and flavorful we can replace water with coconut milk too. We just need to make our imagination run wild with this basic recipe that I have provided and you can have ample of variations each time. 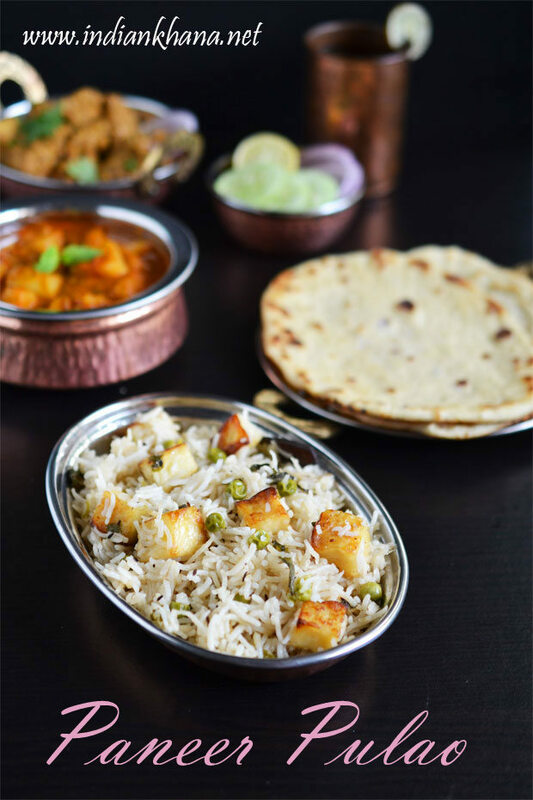 If you like paneer then you should try this and for kids lunch box it's great option too or even for your party or get-together, try something different from your routine stuff. And this fits perfectly for Iftaar or Iftar parties. Let me know how you like this recipe if tried. 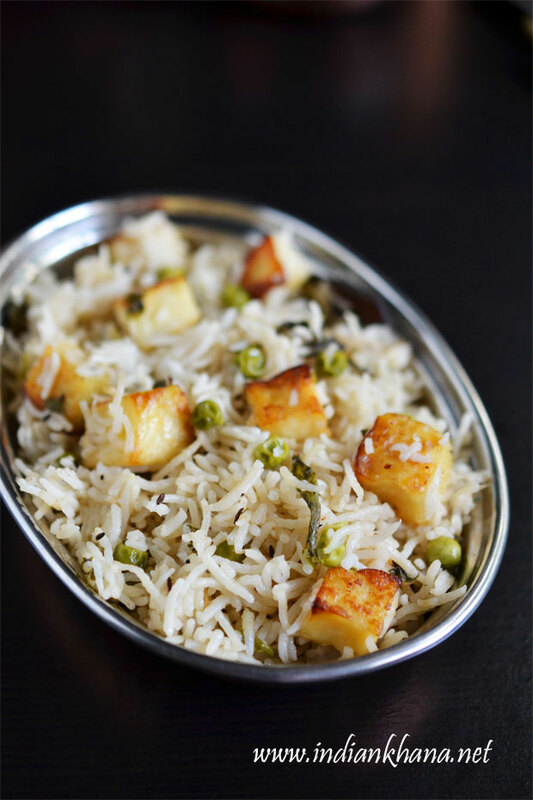 Aromatic pne pot paneer pulao in pressure cooker with spices. 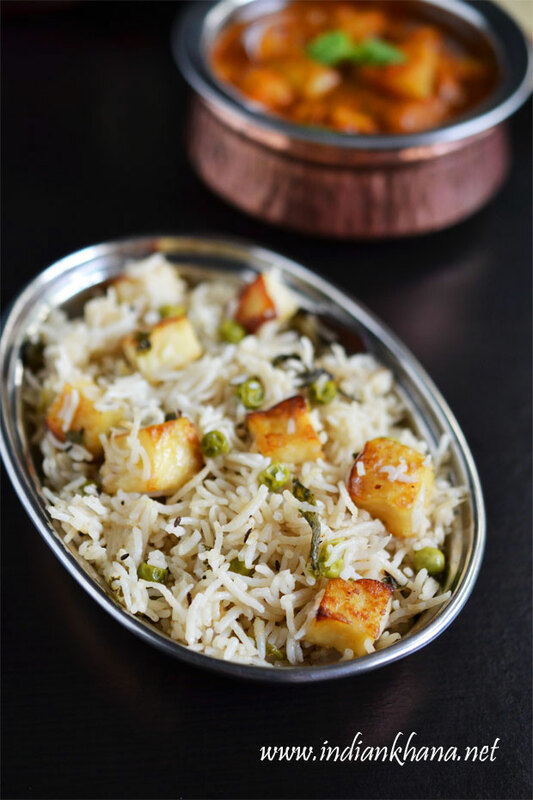 Soak rice for 30 mins and rinse well keep aside, while rice getting soaking peel and slice onion, chop green chili, coriander leaves, clean mint leave.And thaw paneer if using frozen, just take out the paneer from fridge and keep until required. 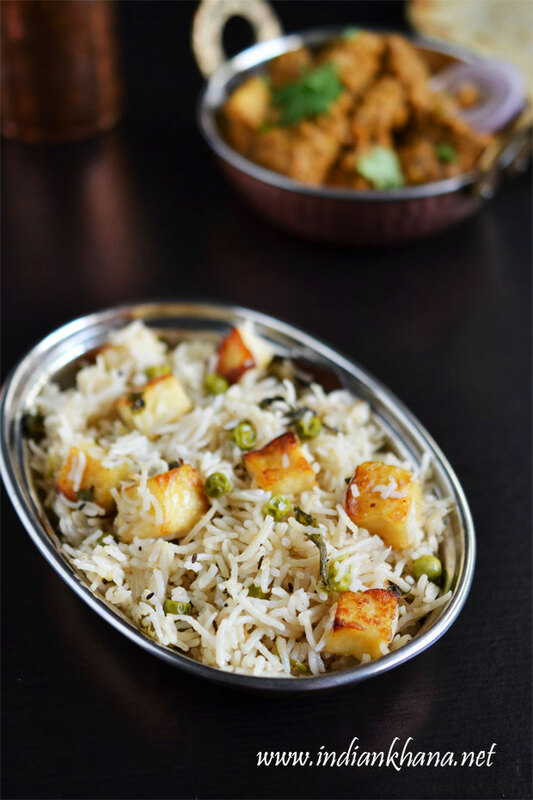 In a pressure cook heat 1/2 tbsp ghee or oil add paneer cubes and saute until golden brown all sides, keep stirring to avoid burning take out and soak in warm water until needed. Add remaining ghee or oil add all khada (whole) garam masala, shah jeera and saute for 30 secs. Add onion, green chili, ginger-garlic paste and saute until onion becomes soft and light brown. Add mint leaves and saute for minute, now add peas and cook for another minute, add washed rice and saute for 2 mins with regular stirring. Add water, salt and mix well, add paneer cubes, coriander leaves and give gently stir, close cooker and cook for 2 whistles off flame. Once pressure released, open cooker and gently fork rice. Serve hot, warm with any raita or curry of choice. You can add any other vegetables like carrot, beans, cauliflower too. You can add 8-10 whole peppercorns to make it little spicy. You can replace water with coconut milk or use half coconut milk and half water too. 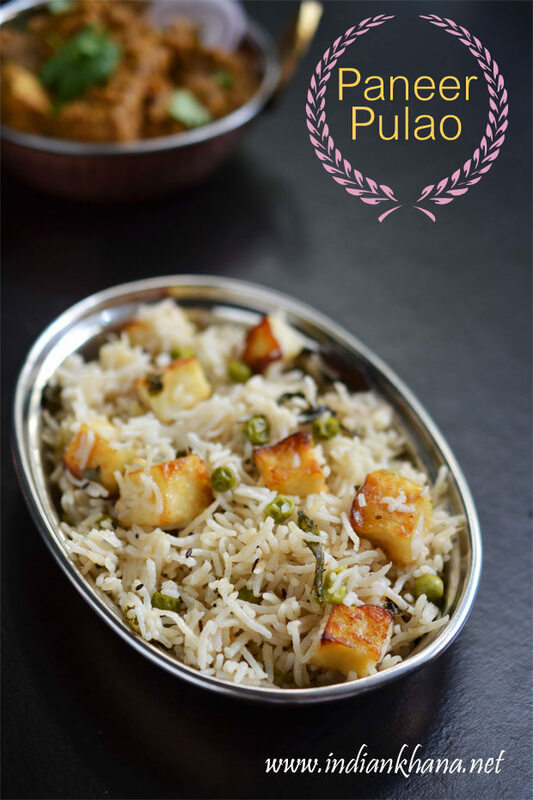 Quick one pot meal paneer pulao.